Go to the Shop for ordering and payment details. We are selling it at a reduced price of £10.50. I’m sure you will not be disappointed. The greater part of this book is “The Letters” which occupy 68 of the 89 pages. The first trigger for a smile is the quote on the front cover of “I think I have written enough to fill a book” (q.v. page 45). The foreword and the postscript (page 77) are by the editors, Mari and Chris Gosling. Pages 7 and 8 comprise an excellent brief history of the Boer Wars of 1880 – 1881 and of 1899 – 1902 and of the Imperial Yeomanry in which Percy Day served, rising to the rank of Sergeant. 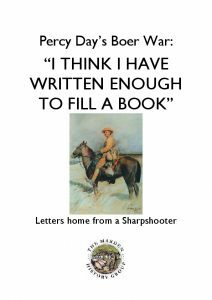 The 68 pages of reproduced letters are a perfect medium for telling the story of the second Boer War from the point of view of sharp-shooting mounted troops and, by reference, of the whole expedition. There is reference in the letter on page 25 to fragile photographs that reminds me that photographs in those days were printed on glass so it is amazing that they would survive being posted from England to South Africa or vice versa with little or no damage despite minimal packaging. The author blandly describes (e.g. in the letter dated 2.06.1901) following orders to take all livestock (chickens, ducks and pigs) from a farm, killing and eating them and smashing and burning the farm buildings and contents and taking the women and children to be put into concentration camps (where many died of starvation) but Mr Day would know nothing of the horror of these camps or the high death rate. He does mention in a letter how very sorry he is for these women and children. In the 15.07.1901 letter, Mr Day mentions that the sentence for sleeping at your post is death and two of his fellows got 2 years hard labour for this sin, therefore they got off lightly! Clearly a deterrent against sleeping while on guard duty is essential or the Boers will creep in and massacre a lot of troops. The letter dated “end of August” relates to the Boers using explosive bullets and setting fire to grassland where British troops are lying wounded so barbarity was not restricted to British troops. Percy Day was taken into hospital with fever and dysentery and later (May 1902) with enteric fever so he at last spent time in hospital having previously bragged about his apparent immunity! The first page of the first chapter of this book relates how Edward’s mother, Christine, (the fifth daughter of seven children) made clear her interest in Edward’s father, Captain James Day RFC and that four of the five daughters married RFC officers. The rest of this chapter gives an abbreviated description of Edward’s Father’s experiences in the Great War (1914 – 1918) these include a lovely story about how pilots and observers protected themselves against German ground-fire that came up through the plywood floor of the aeroplane. They went to the local town and bought all the solid fuel stoves, removed the steel back-plates and sat on them “which was infinitely more comfortable”. Captain James married Christine in the early 1920s and they produced Edward and his sister Rosemary. Edward obviously enjoyed his time as a pupil at St Andrew’s Prep School, Eastbourne and, later, at Charterhouse School at the beginning of the 1939 – 1945 War his efforts with the Charterhouse and Godalming Home Guards. He took charge of the School’s “war communications” using field telephones and signalling lamps. The field telephones were also used to give a running commentary round the course of the annual Cross Country race. Edward joined the Army (Tank Corps) and he was posted to Germany after VE Day then to India, taking his “Crocodile” tanks with them. He was now a Lieutenant in the Royal Tank Regiment. Because of Edward’s war service directly from school, his Father was overworking trying to run the farms. Lord Cornwallis arranged for Edward to be released from active service on compassionate grounds, just in time to save his father’s health. His interest in mechanical harvesting and peeling and coring comes to the fore and his descriptions are very detailed even describing the buying of competitors’ “drops” to peel, core, pulp and sell. He bought a computer in about 1976 to account pay due to up to 400 pickers which saved many hours of manual accounting; he clearly loved gadgets, especially if they made his business more profitable. His descriptions of how they used basic school-boy physics to spray soft crops with water so it froze and protected them from spring frosts and his coming to a deal so his lorries did not have to queue to offload peas still in their pods by guaranteeing his lorries would get there at specific times, all increased his profit. The “Viner” offered similar deals to competitors who were also prepared to risk a penalty if they were late. His interests were far reaching although he never saw the fun in risking his neck riding horses in pursuit of foxes but he loved shooting, especially “vermin” (squirrels, jays, magpies and foxes) which were busy eating partridge eggs. He even organised rough shoots with 36 guns and 36 beaters split into three shoots of 12 guns. He writes at length about his “flying for fun” starting with Tiger Moths and later buying a special Miles Magister in which he won the Kings Cup Air Race. He does not explain why he stopped flying powered aeroplanes in favour of gliders (for a while) but his interest in airborne safety indirectly led to his award of the M.B.E. This is a very interesting book but he cannot resist going into minute detail on the aspects of work and play that interest him. He usually apologises at the end of particularly turgid descriptions though. I will read this again. q.v. the biography entitled “Captain James Day RFC” (Edward’s father) and a very good DVD entitled “The Last Hop Garden in Marden” featuring the late Trevor Simmons both on screen and as commentator. Both are available from Marden Heritage Centre. This book is long out of print but the Heritage Centre usually has a few copies that have been bought, usually by members of the Heritage Centre, in second hand book shops and antique shops in a lot of countries including Australia and at least one from an antique shop in Tonbridge, Kent. We can also still order them from Waterstones. There is a printed dedication as the frontispiece “To the History Group, in celebration and with thanks for all the help and encouragement which made this book possible”. This refers to an original History Group and not the current Marden History Group that established the Heritage Centre and runs it. This book is the epitome of a history book of Marden, or any other village for that matter, and I am happy to re-read it or part of it any time. It is also an excellent reference book comprising eight chapters with three or four sub-chapters to most of them. A lot of the excellent illustrations are from original drawings by the late Bob Highwood and most of the photographs are from the early 20th Century. Even if you do not live in Marden or know it, this is an excellent read and a history lesson as riveting as those I enjoyed from Miss Davie in Junior School in about 1955. CAPTAIN JAMES DAY M.C. – A fascinating account of the life of Captain James Day who farmed in the Marden area and was a World War I bomber pilot in the Royal Flying Corps, receiving the Military Cross and the Croix de Guerre. It is strenuously recommended that this book should be added to your collection, especially in this Centenary period of the beginning of that War. This book is the result of many hours of research and many miles of travel, in both England and France, by Edward Day to add to the limited knowledge the family had regarding Edward’s Father and his Military career but the book is not limited to those few years of danger and horror as it also retells the story of the founding of the (Marden) Fruit Show in 1933 which later grew to become first the Kent Fruit Show then the National Fruit Show. A riveting read for all those interested in World War I history or early aviation. “I appear to have been rather busy” – The book begins with “a week in the life of David McFarland” and it is refreshingly concise. The style of the rest of the book remains similar to the precedent set by the “Week in the life” page and it records his life from birth in 1936 to 2012. It is in a relaxed laconic style and it is easy to hear David’s voice in your head as you read this user-friendly book. Because of his Father’s and his professions, David had a peripatetic life until he and Evalyn moved to Selby Oast in 1986. David was born in Liverpool and he lived there for 3 months until they moved to Nottingham when his father was promoted to Assistant Head of Retail Staff at Boots the Chemist. When David was 6 years old, they moved to Cleveleys, Lancashire. They stayed there until 1945 when the family returned to West Bridgport and stayed in the house he had lived in for the first few months of his life. Later they moved to Carrickfergus, Northern Ireland from 1947 until David was 23, at which point David took part time pharmacy training at his Father’s shop and part time at the School of Pharmacy in Belfast. A brief interlude in an attic room in Gloucester Street, London was followed by a move back to Ulster at the end of his studies. After David moved to Kent, he was a medical rep. and student living at 5 different addresses between 1960 and 1965 having changed career from Pharmacy to the Probationary service; finally settling in Selby Oast, Marden in 1985. I read this book as soon as I bought my copy in 2014 and it has been a pleasure reading it again this year. Price – this may be borrowed by members of Marden History Group, otherwise may be purchased by a donation to cover printing costs. A life at work and play – The first page of the first chapter of this book relates how Edward’s mother, Christine, (the fifth daughter of seven children) made clear her interest in Edward’s father, Captain James Day RFC and that four of the five daughters married RFC officers. The rest of this chapter gives an abbreviated description of Edward’s Father’s experiences in the Great War (1914 – 1918) these include a lovely story about how pilots and observers protected themselves against German ground-fire that came up through the plywood floor of the aeroplane. They went to the local town and bought all the solid fuel stoves, removed the steel back-plates and sat on them “which was infinitely more comfortable”. Captain James married Christine in the early 1920s and they produced Edward and his sister Rosemary. Edward obviously enjoyed his time as a pupil at St Andrew’s Prep School, Eastbourne and, later, at Charterhouse School at the beginning of the 1939 – 1945 War his efforts with the Charterhouse and Godalming Home Guards. He took charge of the School’s “war communications” using field telephones and signalling lamps. The field telephones were also used to give a running commentary round the course of the annual Cross Country race. Edward joined the Army (Tank Corps) and he was posted to Germany after VE Day then to India, taking his “Crocodile” tanks with them. He was now a Lieutenant in the Royal Tank Regiment. Because of Edward’s war service directly from school, his Father was overworking trying to run the farms. Lord Cornwallis arranged for Edward to be released from active service on compassionate grounds, just in time to save his father’s health. His interest in mechanical harvesting and peeling and coring comes to the fore and his descriptions are very detailed even describing the buying of competitors’ “drops” to peel, core, pulp and sell. He bought a computer in about 1976 to account pay due to up to 400 pickers which saved many hours of manual accounting; he clearly loved gadgets, especially if they made his business more profitable. His descriptions of how they used basic school-boy physics to spray soft crops with water so it froze and protected them from spring frosts and his coming to a deal so his lorries did not have to queue to offload peas still in their pods by guaranteeing his lorries would get there at specific times, all increased his profit. The “Viner” offered similar deals to competitors who were also prepared to risk a penalty if they were late. His interests were far reaching although he never saw the fun in risking his neck riding horses in pursuit of foxes but he loved shooting, especially “vermin” (squirrels, jays, magpies and foxes) which were busy eating partridge eggs. He even organised rough shoots with 36 guns and 36 beaters split into three shoots of 12 guns. He writes at length about his “flying for fun” starting with Tiger Moths and later buying a special Miles Magister in which he won the Kings Cup Air Race. He does not explain why he stopped flying powered aeroplanes in favour of gliders (for a while) but his interest in airborne safety indirectly led to his award of the M.B.E. This is a very interesting book but he cannot resist going into minute detail on the aspects of work and play that interest him. He usually apologises at the end of particularly turgid descriptions though. Pages – 75 pages with colour and B/W photographs. FIRE SERVICE MARDEN – This book was based almost exclusively on the memories of 10 former firemen then still living in Marden (in 2012). This book demonstrates the great rapport that exists between these men. From chimney pots to cows in ponds and some major local fires, we learn what it was like to be a fireman in Marden. Pages – 68 monochrome and colour photographs. FRANK COLLINS’ LIFE STORY 1905-1999 –This is a fine, easy-to-read history of the life of a resident of Marden. In 1905, when Frank was born, his father, a farm-worker, was paid 12/- (12 shillings or 60p in decimal money) per week. There are good descriptions of the life of London families down for the hopping. Frank’s father’s charcoal burning (a major source of fuel) and the major cause of the disappearance of the Kent forests, not ship building, because it was not practicable to move felled oak trees to a reasonably sized riverside from Marden to float them down to the ship-builders. There is an interesting 10-point illustrated description of traditional charcoal burning in Marden 100 years ago. As you read the book, you can hear the Kentish (more probably Marden) voice and the sentences are not “sanitised”. They are undoubtedly as Mr Collins spoke. Page 13 refers to the Cricket field in Albion Road “made” and donated to Marden where the Kent Team played an exhibition match and people came from all over Kent to watch. Now unfortunately this green space is designated for building. The manager of the London Fruit Salesmen “Walton and Co” had a farm at Collier Street – Little Spitz Brook. 1921 was a drought and all except one of the ponds dried. Mr Thompsett owned Cockle Pond in Plain Road which was deep and always full and Mr Thompsett let the family have two barrels per day to mix the pig feed. The Collins family has moved to the house in York House, Albion Road in 1918. The shop was open from 6 a.m. to 10 p.m. Frank’s dad used the yard to store pea, bean and tomato sticks, fencing stakes, birch brooms (bessoms) and fire lighting “pimps” but, in 1924, a hoop maker whom they had been supplying with wood, bought the shop “over their heads” and gave them notice to quit. Mr Soaper – a hair dresser from Hadlow, who had bought Mountain Farm for £700 as an investment, agreed that Frank’s father could rent the farm for £60 per annum. They planted a hop garden to make use of the small oast as Frank had been a hop dryer’s helper before. They also grew soft fruit (five acres of strawberries sent to London on the 7 a.m. train). They were still burning charcoal and they sold the hay mowed by their horse-drawn Deering mower. They sold 4 hay stacks to a hay-dealer who came and cut and pressed the hay into half-hundred-weight trusses (bales). Winter work was charcoal burning, cutting pit props (there was still the coal field in East Kent). The General Strike meant no coal so the family bought a Ruston engine bench saw for the fire wood logs. Frank got married on 5th November 1927 on a weekly wage of 18/- (90p). An interesting quote in respect of 1930s hopping – High risk of catching head-lice from London hoppers so Jimmy Read (Village Barber) opened his shop on Sunday afternoons to give Frank and his uncle a haircut and shampoo because they were working six days a week drying hops. *My Grandparents had a similar crystal set in about 1950; the wet batteries were glass and about 10 inches tall by about 5 inches wide and deep. A man used to come early on Mondays to bring a recharged battery and take away the “old” one to be recharged. My Grandparents’ cottage had gas but no electricity. Pages – 31 with B/W photographs. HIGHWOOD GREEN STREET NAMES – The Highwood Green estate is a new development in Marden off the Goudhurst road, the estate being named in the honour of Sidney W Highwood who was a WW1 flying ace and ‘Balloon Buster’ of No 84 Squadron. He was awarded the Distinguished Flying Cross and bar and was raised in the Parish of Marden. All the roads in the Highwood Green estate have in fact been named after Marden people who died in WW1. Alongside their names this booklet contains the accounts of their trials and tribulations encountered during the war until their deaths. All the men bar one were army recruits sent to France to face battle. Most of the men died in 1917. Gaskin Way remembers Ernest Gaskin. Amos Jack Gurr & his brother George are commemorated in Gurr Walk. Heasman Close is named after Charles Heasman. Edward Stanley Mayes gives his name to Mayes Road. Edward Packham is remembered in Packham Drive. Walter Reader and William Reader (unrelated) are commemorated in Reader Drive whilst Charles Russell gives his name to Russell Road. And last but not least, Tippen Way is named after Lewis Roland Tippen, who was a sub lieutenant in the Navy, who died on HMS Invincible on 31st May, 1916. This booklet gives an interesting and comprehensive account of the lives of Marden’s war dead thus named. An Introduction written by Mari Gosling includes the then-recent passing of Bill Peen and a brief history of how this book came into being. Section 1 is Bill Peen’s superb colour sketch-map of the centre of Marden, a single-page narrative of life in Marden in this decade and an index at the same time. Both are self-explanatory even to a stranger. Section 2 comprises the index to the other sketch-map (of Pattenden Lane) which is thoughtfully attached to the inside of the back cover of the book although this map is monochrome as colour coding would be superfluous. Section 3 is a clever, informative and whimsical variation on the modern Yellow Pages displaying advertisements of “establishments by category” from the Parish Magazine of the 1930s – note the absence of telephone numbers from the advertisements. Section 4 lists “Some Family Connections in 2002” with several of the businesses featured on one or both maps, note the use of the word “some”, acknowledging that it is not complete. Section 5 is a request for help regarding where some of the businesses that are mentioned were located in the 1930s. This is a very short book packed with interesting information and a glimpse of life in Marden in that last decade before yet another World War. Pages – 24 pages with maps. Compared with the majority of the History Group’s publications, this is a tome which could easily hold its own with other much more expensive “coffee table” books. 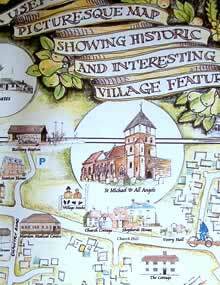 Its genesis was the project to produce the magnificent “Illustrated Map of the Centre of Marden” – also available for purchase from the Heritage Centre and on display in the Unicorn Public House (and the Heritage Centre). Price £10. The project for production of the map was for various local artists to paint water colour illustrations of significant buildings and scenes of the village on white A-4 paper and the selected ones were then digitally reduced to postage stamp size for incorporation in the map. Many more excellent pictures were produced than could be used in the map and an inspired idea was to produce this book of over 200 A4 “landscape format” pages. Eighteen Artists are featured in alphabetical order (by surname) with up to one page of biography of each artist, one page of description of the painting or paintings and excellent matt-finish prints of the paintings; sometimes more than one painting per artist. Pages three and four comprise an Index of the Artists and another of the paintings, both in alphabetical order by surname of the Artist and title of the painting. Even this tome could not accommodate all of the excellent paintings produced by this project and two calendars, one each for 2004 and 2006 and each with a Baker’s Dozen of paintings, were later produced which are now collectable and vigorously sort-after. It was later decided also to publish this book in A5 size but with no reduction in the quality of the book or of the images. This book, of either size, is also an historical document as several of the paintings are of long-gone buildings or long-closed pubs which have been residential for many years or became the Working Men’s Club for instance and now The Village Club. The painting on page 197 for instance is of the “Rose & Crown” Pub in Howland Road which is now a row of cottages called “Rose and Crown Cottages”, unimaginative perhaps but any other name would have been WRONG. Pages – 203 in full colour, landscape format. MARDEN AND P.L.U.T.O. – What is that strange line curving its way across Marden parish from Murzie Barn to Mountain Farm? It all comes from a conversation in April 1942 between Lord Louis Mountbatten, then Chief of Combined Operations and Mr Geoffrey Lloyd, Secretary for Petroleum, about a particular aspect of the Overlord invasion then being planned for the liberation of Europe. “Would it be much of an advantage,” asked Lord Mountbatten, “if fuel pipelines could be laid across the Channel soon after the invasion?” It turned out that it would. Operation P.L.U.T.O. (Pipe Line Underwater Transport of Oil) was set in motion. Marden, being on the route of the overland pipeline from the Isle of Grain refinery to the Dungeness pumping stations, still has a few visible reminders of its role in this “feat of amphibious engineering skill of which we may well be proud” (Winston Churchill). They, together with Marden’s ecclesiastical connections with the Dungeness end of the operation – are detailed in this publication. Pages – 25 A4, with map and colour/BW photographs. SEE ALSO: History Group publications: “The World War II Siren and Red Telephone Box” and a brief history regarding the Stocks. There is also Leaflet No 4 of “6 More Walks Around Marden” – entitled “The PLUTO Pipeline” which is published by the Marden Society. All of these artefacts are on display on the green beside the Heritage Centre and Library. MARDEN LETTER BOXES – In 2009 Royal Mail concentrated Marden’s mail work onto the Tonbridge sorting centre. Up until then, collections from the letter boxes in the local area were handled from Marden post office. In 2002 when this booklet was written there were sixteen (five of them actually being outside Marden parish to the west). Letter boxes first appeared in 1852 and over the years since then some of Marden’s have moved and some have disappeared (two in the last few years). This publication locates, describes and dates the three types of box to be seen in Marden, with colour photographs of each one. Read about their six different manufacturers, the developing pattern of postal collections from 1839 (6pm, from the post office only) to 2001 and a comparison of the number of postal collections in 1911 and 2001. Sadly a lot of these letter boxes have been quietly removed in recent years. Pages – 23 map and colour photographs. Price – £3.00. Pages – 19 – A4, map and colour photographs. Price – £3.00. This book gives the origin of every street name in the parish at the time of publication; it is the sixth edition in six years. As with all books of this nature and subject-matter, more roads and houses are built “in the blink of an eye” so this book is due for another edition but not just yet in view of the current building frenzy imposed on us by people who live elsewhere. Bombs, Drugs, Underpants and Exploding Logs : Researched and put together by an intrepid village team of six archaeologists, cartographers, explorers and historians, “Marden’s Aviation History” records everything that happened in (or fell from) Marden’s airspace from 1915 to 2005. This book is an invaluable companion to a set of footpath walk leaflets (Marden History Group / Marden Walking Group – available from the usual outlets) which includes two walks with an aviation theme. It gives the stories behind the sites visited on the walks and many more. There are several cross-references in this book to “The Fallen of Marden 1914 – 1919” (also available from Marden History Group and Marden Heritage Centre) and access to the latter book makes the reading of this book even better. By the way: the bombs are all over the place (see Richard Adam’s map on page 8 and wonder how Marden ever survived) the drugs are on page 37, the underpants can be found on page 15 and the logs explode on page 5. The anecdote about the pilots of 141 Squadron regularly landing at our aerodrome to take advantage of the “excellent lunches served at the Station Hotel”, Staplehurst in 1918 is amusing especially as we read that the practice was abruptly discontinued by the C.O, of 49 Wing when he was forced into an emergency landing and noticed the neat row of Bristol Fighters whose pilots were at their usual lunch. The saddest story is perhaps the crash of a French “Airliner” (3 crew and 3 passengers) that was en route from le Bourget (Paris) to Croydon on 10th February 1930. Two of the three passengers, a Honeymoon Couple, were killed and the third passenger, Mr Curzon, pulled the three crew from the flaming wreckage. Edited by Chris Gosling. This is an account of bite-sized memories of the children (and young ladies in their mid-teens) who were evacuated here; many of whom got jobs in Marden or, in one case, in the office of a Stockbroker. Some married local people (for instance Mrs. Stanley and Mrs. Ballard) or settled in other parts of Kent. Some memories are sad or frightening or both such as their young memories of Doodlebugs going quiet above them and bombs exploding nearby – there is one memory retold of a boy in Maidstone Road waking because there was no longer an outside wall beside his bed. In contrast, most of the memories are of a welcoming community taking in frightened children, who were not necessarily frightened because the German bombers were over-flying Marden, but equally frightened by the open spaces. Milestones erected by the Turnpike Trusts in the 18th Century become more and more vulnerable as traffic gets heavier. One of Marden’s was damaged in 2008; happily, now repaired. Only five of the milestones still survive. This booklet includes illustrations of all of them and a map reference and brief description of their location. For the least adventurous who would still like to dine out on tales of an adventure in Marden, a visit to the stone featured as Figure 4 is recommended as it is 30 yards east of the Heritage Centre on the north side of the High Street and it features the accurate but slightly eccentric inscription “Marden 0” as it is in the centre of the village and snug against the east wall (south east corner) of what some consider to be the oldest building in Marden – White Lyon House – which is 15th Century or even earlier. This milestone is the favourite of several people who are resident in Marden. This little booklet will enable you to seek out our surviving stones, read the story of the turnpike roads and enjoy this aspect of local history. This is a digital reproduction of a scrap book compiled by a lady who was born in 1890, died in 1977 and who lived all of her life in Marden. The original scrap book, which is in the possession of Marden History Group, is dated “Winter 1951/1952”. It was rightly decided to produce this version because the original was beginning to show signs of wear as it was read or at least appreciated by the History Group and others. The originals of the many monochrome photographs are very sharp and the reproductions within this version are, if anything, even clearer than the originals although still faithful to them. Miss Walter’s pen and ink drawings and maps are clear and “user-friendly” although, as she states on one map, they are “not strictly to scale” but I feel this is, perhaps, an unnecessary self-criticism as I would be pretty proud of myself if I had drawn it free hand as she did. Every page of the book contains interesting or informative (or both) facts but Miss Walter’s spread sheet of population fluctuations is worthy of additional comment. The small dip in population (25 people) between 1831 and 1841 is probably not significant but this is then followed during the next 10 years by a leap from 2,075 to 2,300 with a similar leap between 1901 and 1911 from 2,325 to 2,600 followed by an equivalent drop within the next 20 years back to the 1901 level and a bounce-back to 2,500 in 1951 which was almost exactly the findings of the 1921 census. All, no doubt, influenced by recession, war and post-war “baby-boom”. Sorry anorak episode over. Miss Walter’s conclusion, in which she envisages the next 50 or 100 years (from 1951 of course) includes many depressing predictions, a significant number of which have been postponed thanks to the Marden Society and the Parish Council but many others are threateningly imminent thanks to the mismanagement of other local authorities. Like “Miss Walter’s Marden”, the original of this was a School project but, unlike that book, this is physically a much weightier book of 178 pages. Also, like Miss Walter’s book, they used the same cost-effective technique of side-punched paper stitched together with green cord (the gold cord used for the other book was presumably already used up). I seem to remember this technique being used in my school days too – 1950s). Whether or not Ann copied the history of Marden, especially that of the Church, verbatim from another source, it is clearly worded and beautifully phrased to share the facts with the reader especially the “Paradise” above the porch and south door. I have been in that room only once (about 25 years ago) and it is still a vivid memory and quite sobering to think of the Priest living his solitary life in there with no heating other than sunlight through the window (I do not remember seeing a fire place) and taking his exercise “on the leads” at the top of the spiral stair-case with access to his room. The cutting about Jack Collins, the Marden Pidgeon Shooter, is an informative but sobering read. Some interesting commodity prices from Stuart times are carefully transcribed but it is a little frustrating that there is no note of what a farm labourer or shop assistant might have been paid in the 1660s but a gallon of Claret at 4 shillings (20p) is, at first glance, cheap although nobody but the gentry could afford to buy wine then. Ale and cider would be the norm for the working man and probably brewed on a farm. The train times for 1955 indicate that our current train service is so much better (or more frequent) now! The first “up” train is listed as 07.15 compared to our first train at 05.24 with a journey-time of about 60 minutes (Ann does not give us journey times) so our first train gets to London more than 45 minutes before Ann’s first train would have got to Marden and steam trains do not accelerate like electric trains can so her journey (if she ever travelled on a train) would have been much longer in time elapsed. There was little commuting in Ann’s time and even the word commuting had not reached these shores then. Ann also records the building of the first council estate of 74 dwellings and she lists three times as many pubs in Marden in 1955 and she does not include the Milebush (R.I.P.) in her list. SOME FARM IMPLEMENTS AND STRUCTURES – A most interesting collection of illustrated agricultural notes relating to the village of Marden and the surrounding area. Many relate to the Hop picking industry. This is a lavishly illustrated book; almost all of the photographs are attributed to the various photographers or with a History Group catalogue number. The drawings are not all attributed but I believe that they are by Ida Fermor & others and Trevor Simmons with the benefit of his encyclopaedic first-hand knowledge of the tools and structures of a by-gone time in Kentish agriculture. A very successful collaboration between Mari Gosling and Trevor Simmons and various artists. Percy was born at Southon House, Marden, joined up with the Royal Naval Air Service in WW1 and kept the “Soldier’s Diary” from 1st Jan 1917 to 24th Feb 1919. This book is mainly a transcription of the Service Diary of the father of Mike and Robin Judd. He joined 8 Squadron Royal Naval Air Service in 1916 (for active service in the Great War) as Ground Crew keeping various marks of Scout aeroplanes operational or repairing battle damage to them. There was often only primitive protection from the weather, sometimes just a wind-break and food did not always arrive so they would then go hungry. Mr Judd notes in the diary that, with effect from 1st April 1918, all RNAS squadrons and men were transferred to the new RAF which was an amalgamation of RNAS and RFC (Royal Flying Corps) but he does not explain why his No 8 Squadron is now numbered 208 as it is obviously common knowledge to all of them. The answer is that the authorities appreciated that there were now potentially a lot of pairs of squadrons with the same number so the decision was that all RNAS squadrons would have 200 added to their respective numbers so Mr Judd’s Squadron would henceforth be referred to as “208 Squadron RAF” to preserve their identity but avoid confusion. He was not demobbed until February 1919 and, when he got back to the family farm in Marden, having travelled by train, his brother’s effusive welcome was “You’re home then”. This book was published 6 months after Mr and Mrs Gosling’s book “The Fallen of Marden 1939 – 1945”. The two books are equally well-researched and written but with no respective knowledge of each other’s project until later. This book is not just a comprehensive reference document of the Fallen of Marden and Collier Street (which was still part of the Parish of Marden then) in the Great War. There is a bonus on pages 40 – 43 inclusive of a “time line” of the major battles as a context to the chronological dates of death and locations of respective graves or memorials. Although the Armistice was effective, in theory, at 11.00 on 11th November 1918, servicemen and civilians, were still dying of wounds and injuries sustained during hostilities after that date so a significant number of Memorials include those who died in 1919. This is a “user-friendly” reference book and it is very sobering that so many of this relatively small community died in action or prematurely after the War and not just in the cold mud of Flanders. Pages –74 with colour and B/W photographs. Abridged to a LIST OF MARDEN’S FALLEN 1914-1919 P.O.A. Published a year before Mr Collins’ book on “The Fallen of Marden and Collier Street 1914 – 1919”, the two books, are of necessity, in different formats and this one also reflects the significant loss of life within the Parish caused by instances of enemy action between 1939 and 1945. The book was originally published to commemorate the 60th Anniversary or the Pattenden Lane deaths hence the seemingly paradoxical order of the categories. A significant number of the entries in the book are illustrated with colour photographs of the memorials of some of the deceased and some monochrome photographs of some of the deceased. There is also an excellent eye-witness memory by Bill Peen, who was 16 at the time, of the air raid that killed so many in the Maidstone Road including a soldier home on leave; I can still hear Bill’s voice in my head as I read the words. Pages – 58 with colour and B/W photographs. THE FRANK WOOD PAPERS – Frank Wood lived all his life in Marden. He would make notes and jottings about anything that stirred his interest. Frank was a knowledgeable gentleman and Christian (spelt with either a capital or lower case “C”). This publication records his memories of Marden, the families who lived there and the changes that he witnessed from an early age until his death in 1998 aged 85 years. He told me many stories and never the same story twice, most of which are reproduced in this book. Among other jobs, culminating in being Postmaster, in tandem with his wife Jessie, at Marden, Frank worked in a sawmill and wood-yard along the Goudhurst Road and also as a lumber jack in Mote Park, Maidstone and at RAF West Malling during the 1939 – 1945 War. Unlike a lot of people in any of these professions, he still had all his fingers and both thumbs. Health and safety in these dangerous professions were not a priority in those days. He was a good violinist and he and Jessie would duet with her playing the piano, usually in their living room at Cornerways, Marden. 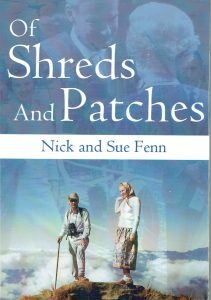 This is a lovely book about two lovely people and their experiences in this part of Kent during the majority of the 20th Century. I am long over-due for the treat of a re-read. A previous edition was entitled “Frank Wood, Memories of Marden” and this new title is to avoid confusion with other titles in the History Group’s Library. This third edition includes additional clarification on page 44 regarding the Waterman Family. Pages – 74, mainly colour and some black and white photographs. THE ITINERANT WALKER ORGAN – This booklet relates the various episodes of construction, dismantling and reconstruction of a classic Pipe Organ as a distinctly peripatetic musical instrument. The organ was allegedly built in 1852 and was advertised for sale in 1928 from the Church in Southborough. The organ was purchased by two churchwardens for St Michael and all Angels, Marden to replace the worn-out one and so the journey began. This organ had already been rejected by the Rev. John Arthur Finch when he was Vicar of Bredhurst. It is understood that he was horrified when he came to Marden as Vicar in 1929 to discover the Walker Organ awaiting him. The latest series of rebuilds was by Julian Hopper, a man who had never before refurbished a pipe organ but he is an experienced car restorer so he learned the art of organ restoration from a manual. There is a liberal sprinkling in the booklet of colour photographs and a print of a superb painting of Sheephurst Oast by Ida Fermor. The narrative was written by David McFarland with acknowledgments to Mari Gosling, Ken Jenner, Colin Whittle, Mike Judd, Ida Fermor, Penny Day and Ian Newton. The booklet comprises 12 pages; it is gratis from the Heritage Centre although a donation is welcome. As recently as thirty years ago, when I came to live here, there were twice as many Pubs as there were in 2012 and, since then, most of the survivors are now either private houses, demolished or restaurants. This superb book (more correctly referred to in the introduction as an “Album”) is perfect for “natives”, new-comers like me or visitors with extras including an application form for membership of the old “Poplar Tree” which is now the Marden Village Club. There is an illustration of each of the pubs featured although some are shown in their current roll, mainly private houses. Sources and Village Club Application Form referred to above. A stroll round Marden, album in hand, makes an educational few hours followed by a pint in one or all, of the still-trading establishments, exercise, education and refreshment. It is not essential to be a member of this club to enjoy this book although I joined as soon as I came to Marden in 1986. The history is written in flowing English as any would expect from the editor and even the “horror” of an overwhelming vote for prohibition within the “Institute” as it was then is dealt with as a strictly factual narrative. We are reminded that the first Chairman in 1907 was Rev R.E. Johnston (who, in 1922, proposed the prohibition) and the President was F.S.W. Cornwallis Esq (later, in 1922, referred to as Colonel and, even later he was Lord Cornwallis). He had what is sometimes referred to as “a good War” which often means he survived, unlike a lot of others. Luckily for Marden, he was a benefactor of the Club, the Fruit Show and many other important events. Pages – 32 Price and availability on request as it was not published by us. Pages – 131 – A4 with fold-out plan and comprehensively illustrated in B/W and colour. If only one of these aspects catches the reader’s attention, it is more than likely to be Chapter 3 featuring 68 surprisingly good quality reproductions of the glass plates but, much to my joy, the negatives have been converted into positives thanks to the skill if Ian Newton of Marden History Group. Most of the subjects of these pictures are either identified or cross-referenced to other images in this chapter. A valuable and interesting bonus is Chapter 4 which features 18 pages of narrative and images of early to mid- twentieth century postcards and photographs relating to the Sutton family and their business and a very affecting (to me) report of the death in action of Ivan Sutton (aged 19, who, with his Lancaster crew, were killed on 4th May 1944, during an attack that destroyed the “biggest German tank centre in France” which obviously had an effect on the success of the D Day invasion almost exactly a month later. I still own a pruning knife that I bought from the Sutton’s shop; it is very sharp and only rarely needs to be honed. I do not loan it as I fear it might not come back. THE WW2 SIREN AND TELEPHONE BOX – When we installed our Heritage Centre in our local library, in November 2007, we were aware that a World War II siren post, located behind The Unicorn pub was about to be excavated to make way for house building. This prompted us, for some reason, to recognise that the village no longer had red telephone boxes. My colleague, Colin Whittle, set out to search for both a siren and a red telephone box. Eventually he found an unwanted, disconnected box in Benenden, a nearby parish. Their Parish Council were happy for us to have it. It was excavated by another of our volunteers, Trevor Simmons and his son Duncan. It was transported to Little Mill Farm by Homeleigh, a builders’ merchant, for storage. Eventually it was transported to Tomkinson’s local warehouse from where it was transported by them to a nearby car repair business, Full Circle who restored it. It was then again transported by Tomkinson’s men to the library and Heritage Centre site, which had been prepared by our local firemen in their free time, to join the World War II siren and post erected by the firemen and Homeleigh in time for Remembrance Day, Sunday 9 November 2014. All the above was completed without charge and with the goodwill of all concerned. The text of this book was completed in about two days after the Siren was sounded on Remembrance Sunday 2015. This book is liberally enhanced with excellent illustrative maps, plans and colour pictures which, as we know, are the equivalent of a lot of words however apt the words might be. Many people and organisations donated their skill, time and money to this project, many of whom are acknowledged in the text. Those of us of a “certain age” remember these sirens being used “after the war” to summon the firemen from their respective places of work in the event of fire; there were few telephones in the 1950s, even in business premises. Our nearest siren when I was little was almost exactly one mile from the parental home and we heard it clearly when used to summon the Firemen. Pages – 22 with colour photographs Price – £5. Its sales will help to offset the other costs of more than £2000 required to set up the site adjacent to the Library and Heritage Centre. This is a superbly edited collection of excerpts from transcripts of interviews by half a dozen people of about 30 residents of long-standing in Marden. It is not intended to be the only volume of these edited memories and further excerpts will be published, I hope, and there have since been a lot more interviews conducted and transcribed to preserve the memories of others and form the basis of the next volume or volumes. None of the interviewers conducts interviews for a living but the editors have transformed the transcriptions into an entertaining and informative narrative. The original audio interviews (conversations in many instances) are preserved for posterity but this book is arranged under nine different topic-headings with an interesting and useful Introduction and a Conclusion that confirms the intention that this will not be the only volume. The topics are “Farming”, “Shops and Businesses”, “Housing”, “Schooldays”, “Transport”, “Wartime”, “Welfare”, “Religion” and “Social and Welfare”. It is not essential that the reader knows or knew the people who are quoted but it does add a little extra; at least it did for me and excellent editing makes this an entertaining and educational book in what is now called a “user-friendly” format although I prefer to call it “well written” – (I was not one of the authors or editors). This is a transcript of the diary of a teenager (before the term was used) in Kent during the Autumn of 1940 and into January 1941. There is an entry for almost every day during the height of the Battle of Britain but the entries are “thinner” in November and into January. Despite the bomb-blasts removing windows, including those of the family home and several raids each day at the height of the battle, there is a laconic tone to the entries. In the entry for 31st January 1941, there is a typical entry in this style, “During the afternoon, we heard several Jerries which sounded pretty low, but did not take any notice”. Marden Design Statement – The past, present and future of Marden. Loose-leaf A4. Free (pay only P&P).